The band that entered Conny Plank’s studio in 1981 to write their fifth album was decidedly different from the one that had recorded the previous four. For starters, Ultravox had finally broken through to the mainstream of the UK charts with the third single from their previous album, “Vienna.” They had finally arrived. So life became a whirlwind of promo and touring, leaving little time for songwriting as they had many duties to fulfill other than pressing keys and strumming things. This would have major repercussions on how the album eventually developed. For the first [and last] time, the band members holed up in Germany in their producer Conny Plank’s studio with nothing in hand and proceeded to write and record the whole thing over a protracted three month period that was very trying for all involved. It was a rough ride for the musicians and it is reflected in the psychic overtones of the album’s songs. Almost all of them [apart from one] deal in fatalistic emotions and a palpable sense of dread hangs over the album, insuring that it remains the most cohesive document that Ultravox ever recorded. It’s a mobius strip of artistic angst that inadvertently marks it as the apotheosis of New Romantic sentiment and the acme of that particular subgenre of pop. The closest thing here to an upbeat number leads off the album and was its second [final] single. “The Voice” is packed with lush, streamlined dynamism and was propelled forth, like so many of these songs, by enervated, motorik drum patterns courtesy of Warren Cann coupled with throbbing, sequencer-like bass lines from Chris Cross. The sound is richer than most of the material on the preceding “Vienna.” Back in the spotlight is Currie’s ARP for nearly the last time as the group would gravitate to digital synths on subsequent releases. They wouldn’t sound this good again, though how much of that can be put down to Plank is debatable. Much of the rock urgency of previous albums have been replaced on this album by a reliance on overall atmosphere. And that atmosphere, for the rest of the album, is best summed up as dread and decay. There is less variety here than on any other Ultravox album, but the cohesion is so thick that one can practically cut it with a knife. “We Stand Alone” began with throbbing bass and a repetitive Klaus Dinger Apache beat that didn’t vary for much of the song, but then again, so did half of the album, with tempos varying only slightly. A similar rhythmic feel can be found on “I Remember [Death In The Afternoon],” “Stranger Within,” and “Accent On Youth” as well. “I Remember [Death In The Afternoon]” was an urgent number that would have made for a great third single, if saner heads had prevailed. The segue from the previous song ended with an abrupt click to be immediately replaced with a throbbing synth bass line rising in a crescendo with the motorik drums gradually faded into the song. Ure’s angst-ridden vocals were typical fare for this album as he emoted lyrics which conveyed a palpable sense of dread without making much sense at all. Don’t worry. This album was all about feeling. Claustrophobic, unrelieved feeling. Side two began with the intense leadoff single “The Thin Wall.” The song was driven by relentless sequencers and synthetic percussion effects. Six months later, it seemed like the rhythmic foundations of this song were the blueprint for the second Visage album, “The Anvil.” Much of “The Anvil” seems to have been extrapolated from the framework that this song provided. Elsewhere, Currie’s violin makes a welcome appearance on the song’s middle eight with a solo that’s an old country lamentation at its most fervid. Ure was visibly agitated as he at first decried those who would look askance at the New Romantic movement and then attacked those who held political power. Wha…? It may not make much sense but it does sound fantastic and emphatic! And this is an album that was all about sound, not necessarily content. But the sound has been carefully burnished with all of the considerable craftsmanship at the band’s disposal and you are not likely to hear music this assiduously polished and buffed repeatedly for its cosmetic effect anywhere else. The next track was the long “Stranger Within” which stretched the album’s thematic conceit to the breaking point and then some at seven and a half minutes. It seemed like the soundtrack to an atmospheric horror film, possibly Polanski’s “The Tenant,” as it related to an unnamed internal horror. But it eventually overstayed its welcome, ultimately giving the album a demerit. The next track, “Accent On Youth” formed another long seven minute suite with what’s actually its coda [“The Ascent”] cannily branded as a separate track for more publishing income by the now savvy group. The percussive attack of “The Ascent” culminates in another dramatic segue that converged into the melodramatic conclusion to the album. “Your Name [Has Slipped My Mind Again]” kept up the trend of the last song on each side having a parenthetical title. On this track, Ultravox took their penchant for stark, echoic rhythms [“Just For A Moment,” “Vienna”] to its almost ludicrous conclusion with liberal amounts of echo added to what sounds like eight inch thick dictionaries being slammed shut… in a cavernous space. The rhythm is only around 15 BPM but you would be in no danger of missing it! Apart from Ure’s desensitized vocals and some melodramatic piano, that’s all the track offers to the discerning ear. That it is unmistakably Ultravox in feel is a testament to how focused the band had honed their vision for this release in particular. The results of the band’s entombment in Conny’s studio for three months was absolutely the group’s most claustrophobic and introverted album ever. The stench of ennui mixed with regret and existential horror gave this album a distinct vibe like no other in the Ultravox canon. It may not be their most diverse album, but it is both highly accomplished as well as being their most fully realized and coherent album ever. If you’re in the mood for a dour if intense descent into paranoia and angst, look no further than this release. It’s got you covered. In spades. Next: The surprising return of… George Martin…?? This entry was posted in Core Collection, New Romantic, Rock GPA, Scots Rock and tagged Conny Plank, New Romantic, Ultravox. Bookmark the permalink. 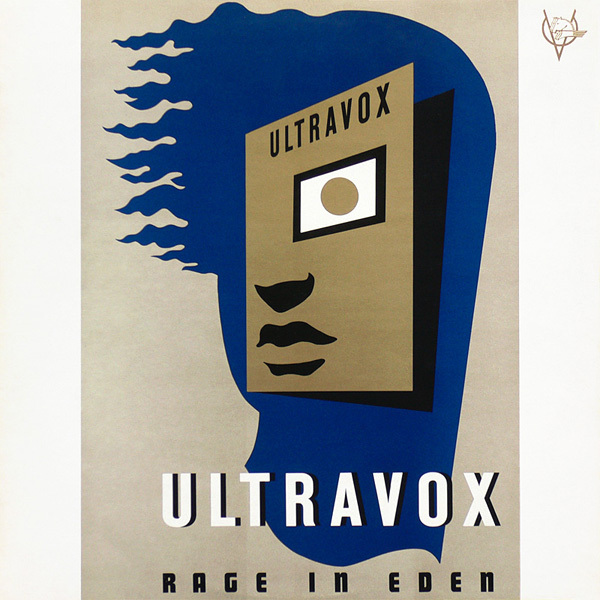 Hands down, for me, the best Ultravox album! I can’t just listen to any one song on Rage In Eden without wanting to hear the rest of it. The albums, tense, introverted unease was musical crack for me at 18. The strongest underlying theme I get from Rage In Eden is one of trying to keep from losing control. We Stand Alone is probably the best example of this the mortorized cords of Ure’s guitar wind up tight and then cut loose with his vocal attempting to keep everything together. Rage In Eden came out at a time when I was beginning to really gravitate toward the darker, more thoughtful side of music coming out. I was embracing bands like Magazine, The Bunnymen, Joy Division, Siouxie and the Banshees and The Cure more and more. The music felt more in tune with what it was like to be aging away from my teens, going to college and having to make decision for myself. I really like what you said about the albums almost the album representing the pinnacle of what was the New Romantic sub genre. While it doesn’t have the feel or lightness of much of what was coming from the scene, it IS the direction the genre would naturally have had to evolve. I was not a big fan of The Anvil when it came out, but over the years have also heard more and more of the Ultravox influence on the album. I’ve always felt Rage In Eden was the soundtrack to some unmade late 1920’s Fritz Lang movie or some lost Bunuel/Man Ray film made in the darkest depths of Surrealist Paris. The angular, strict rhythmic lines feel like musical art deco. I think this is why Pete Saville’s artwork and design on the album work so well. I know making this album could have broken the band and would have done to many another less focused one, but I do wish Conny Plank had remained involved with them for a bit longer. I know we will get to all this in Part 6 and I will leave it until then. Echorich – Agreed. It’s so cohesive that it really falls apart if you try to cherry pick material from it. It’s sort of like “Empires + Dance” in that regard. It’s a complete song cycle. Yow! There’s another 1980 classic that I didn’t hear until [gasp] 1982!!! I thought carefully before I dinged it 0.5 pts. for lack of variety, but yes, I have to go back to my original take of 4.0. It’s too strong a unified achievement not to, even if “Stranger Within” drags on a bit too long. I think that by the time I get to Stranger Within, that I am so totally on board for the musical journey that the length of the song goes unnoticed. Side Two does have a certain suite like arrangement and it all makes so much sense. Echorich – Ultimately, you are correct, sir. Hence my GPA revision.